stickboybike: Monday night social ride. Slayer 50 pt 3. Monday night social ride. Slayer 50 pt 3. The bike goes as do I. Does that make sense? No. But how things work with bikes and how they may have been engineered to perform remain unseen at first...I'm babbling, I know. The Slayer 50 is exceeding some of my expectations and there are other things that are what they are because of what this bike is intended for. Yes it has a granny gear and can climb hills. Not quickly but if you keep the pedals spooled up, the bike digs in deep. Maxxis ST DH tires, 2.35 size tires with tons of grip. On the Monday night ride this week, I had riders on 2 seperate occasions state that I was kicking up sand in their face. Yes they are tacky but heavy. Think rock crawling traction over rocks going up hill. I have been running 40 lbs air pressure front and rear. I have ridden 30 and that was like lead was poured into the tubes, way slow. The balance of the bike front to rear feels almost 50/50 when you pick up the bike. 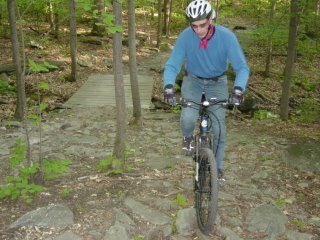 I was able to ride a good section of trail 2 one handed over baby heads as I fought to put my cell phone into my Camelback. The Marzocchi AM2 fork is 150/13o travel ETA ready. 150 is bottomless feeling for normal trail riding. I like the rebound set in the middle, not a pogo stick and not so slow that the travel packs down on a long descent. When I flip the ETA on the fork I get a 20mm lock down with 130mm left of travel. This I have found does a couple of things. 1) The head tube angle gets steeper/lowers the front CG for aiding with climbing. Steeper means quicker steering too. 2) The angle of the Low Center Counter-rotating linkage is placed differently over bumps and trail features. As rocks and things that go bump in the night hit the rear in the 130mm position the small speed/stutter bumps are felt more. Not a bad thing as I like that 130 position for hopping logs. The rear can be preloaded to hop logs without the super squish setting when the head tube is more slacked on the 150mm setting up front. Make sense? This is what I have been experiencing on the rides. I haven't read anything online or in mag reviews about this new found trait of the Slayer but damn it feels good. Monday night ride. Chalked up about 29 riders. Still like to see the ladies showing up. One of my customers was sporting an RMB RC50 with CX tires. 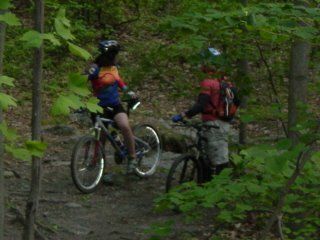 I was impressed with his bike handling skills and the ability to not flat a set of 700x30c tires at Rocky Ridge. I like this cutover from T4 to the mid point of T6. It's armored so despite its pitch errosion is nil. The bridge below is showing its age with loose planks but that adds character. Here is a happy guy. Always smiling when he looks at me. Maybe I have something hanging out of my nose? Amored cutover rider right side. This guy had a good run at it and ate it up. Good dig! Sherri on the left, Lindsey on the right before the bridge. Sherri has a great spirit and is always encouraging the ladies that attend the MNRs. 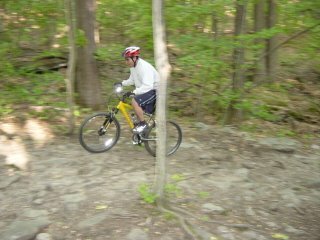 Saturday I am off to Moutain Creek, NJ for the US Open of moutain biking. I'll be at the Rocky tent setting up demo bikes and emersing myself in the DH mist of the Garden State. Have a great time on Saturday and be safe. Dude, how is the bike holding out? I'm looking to buy the same one.